Our daughter Jane was diagnosed with hip dysplasia in 2012. 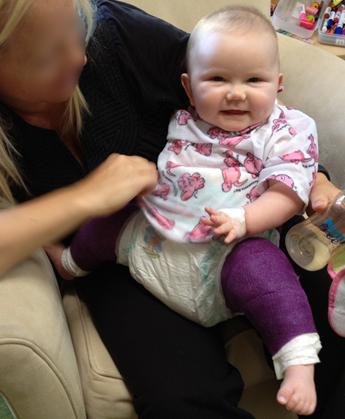 After spending 3 months in a pavlic harness, we learned that she’d have to spend at least 12 weeks in a spica cast. As a result... we amassed a lot of tips, tricks and best practices about how to care for a child in a spica cast. Therefore, we’d like to pass this knowledge along for parents of hip dysplasia children that are about to experience life in a spica cast. This site is a labor of love and a way to give back to the community. We've done our best to make it a concise list of tips, tricks and best practices. Only those that we’ve learned or have been shared with us. Therefore, if you have any ideas, practices or comments that you would like us to pass along to other parents of hip dysplasia children, please email us. To help you quickly and efficiently plan for the reality of living with a spica cast. Identify those products and services that will improve your child's quality of life. Give back all the great advice that others have generously shared with us. First, we are not doctors, just parents sharing what we have learned. Therefore, do not interpret anything that we say here as medical advice. Second, all of the information and opinions we provide is based on our experience with our daughter's spica cast configuration, which has he legs spread approximately 150 degrees apart (see picture below), and with a slight bend in the knee. Please make sure your doctor describes the type of cast your child will be in before finalizing major capital purchases (like car seats). And finally, we want to give a HUGE thank you to the good people at Lucille Packard Children's Hospital who helped us through this challenging process. Again, if you have comments about this site or would otherwise like to help, please drop us a note.